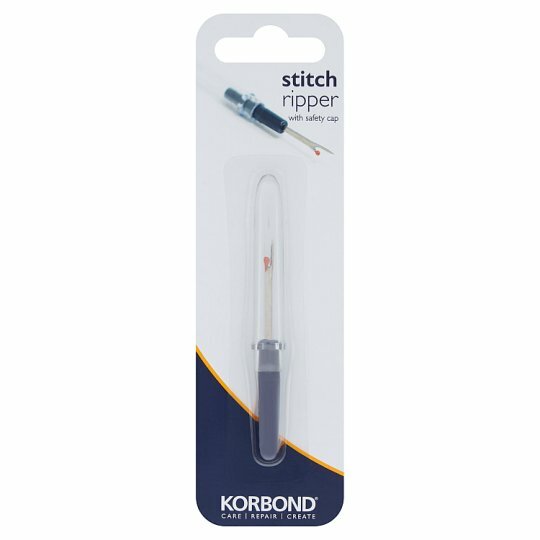 Korbond Stitch Ripper is a handy tool designed for unpicking stitches. Ideal for cutting button holes, removing zippers and opening seams. When using the stitch ripper take care to cut one stitch at a time, attempting to cut through more than one stitch may result in fabric pulling or snagging. Insert the pointed end of the ripper underneath the stitch that requires cutting. Allow the thread to slip down the fork to the blade, and then lift upwards allowing the blade to cut through the thread. Repeat cutting of individual stitches until several loose ends appear. These can then be gently pulled out by hand.